As a religious historian this history is often repeated: Religious leaders make outrageous promises to their flock, that can’t be kept. They get paranoid. They look for someone, and something to blame. Trump and his Christian base chose the Democrats to blame. Traitor Trump took that message of Christian Hate to our troops, many who are Democrats, and come from families that vote the Democratic ticket. It is clear to many, that Trump will do anything to keep himself and his family out of prison. The POTUS uses young Patriots as The Trump Human Shield. He creates chaos and hides behind the fake wall crisis, and the real crisis he created by withdrawing our troops from Syria. Most Christian Leaders back these evil tactics. They will overlook more lies Trump tells, this time to Warriors who took a oath to protect – all of us! Trump is lying to young people in order to get them to hate all Democrats. Trump is doing exactly what Putin wants him to do. He wants to divide Americans in every way. I now conclude Trump is working for Putin. This is an attempt at a military coup. Russia wants to see our troops defend their agent. Christianity has failed this Democracy. They have made a political home for the devil that is called a “liar”. Politics is not THE ANSWER for Christians. They are rendered incapable of teaching anyone about Right and Wrong. Trump has BANKRUPTED his base! 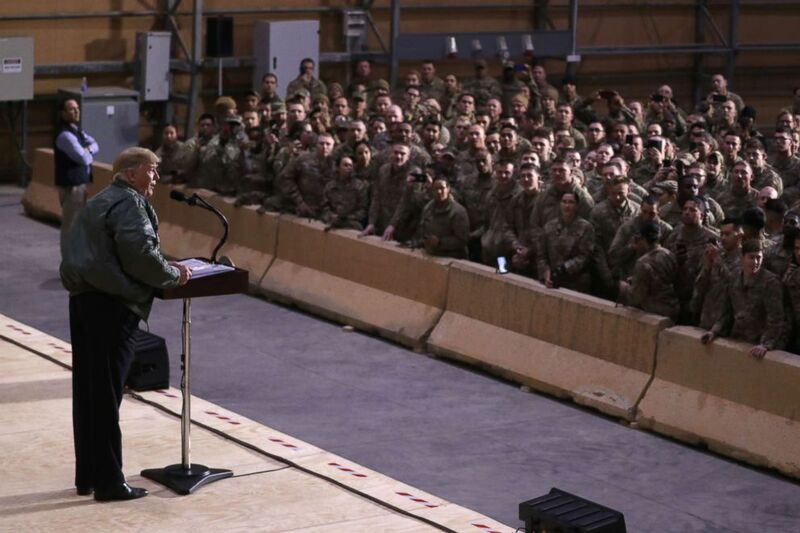 President Donald Trump struck overtly political chords as he addressed service members during a speech at the al-Asad Airbase in Iraq Wednesday -– his first visit to an overseas military installation. Abandoning, as he has before, the traditional maxim of politics ending at the water’s edge, the president said his military strategy puts an end to the United States being “suckers” and hammered Democrats for resisting his demands for border wall funding. The president appeared to lie to the assembled soldiers about their pay raise this year and re-enacted a conversation with his military advisers who he claimed had encouraged him not to remove American troops from Syria. “The devil is a liar” is familiar Christian teaching supported by biblical text (John 8:44) that declares the devil to be the original liar, intent on destroying our relationship with God (which he did to get us kicked out of the Garden of Eden). Yet despite Donald Trump’s habitual lying, evangelical support for him has been and is robust, with some evangelical leaders endorsing his candidacy, declaring him saved from past and current transgressions and ignoring his propensity to lie about things big and small. This support has been justified as forgiveness; however, forgiving doesn’t require us to hire the devil to do God’s work. Even if we forgive the devil, we don’t put him in charge. Besides, Trump is supposed to ask for forgiveness — something he won’t do because he says he has done nothing to forgive. This, of course, is a lie. Accepting Trump’s habit of lying compromises Christian principles, since lying can’t be both a sin and acceptable behavior. Nothing is more detrimental to faith and believing than lying, which is what the devil is about.